This printed book is rich in its many layers of information. 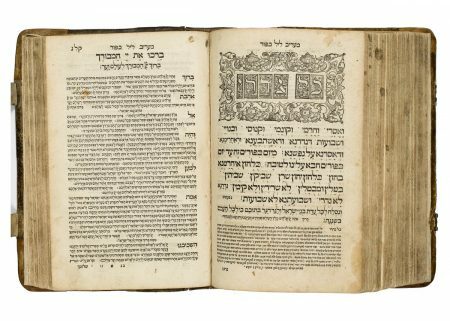 The mahzor contains the standard prayers and special liturgical hymns for the entire year ac- cording to the custom of Western Ashkenazic Jews. At the head of each liturgical hymn, a short note summarizes its poetic features and offers a capsule of the theme of the poem. The main prayer text is accompanied by a commentary and by a compilation of rules and customs relating to the rituals to be followed throughout the year. The latter is headed Ma’agelei Tzedek, the title by which the entire mahzor is subsequently called. The volume contains many comments written in an Ashkenazic hand of the seventeenth century. The annotations correct errors in the printed text, add explanations, and complete omissions. Hamburger 1988, vol. 1, pp. 48–50; Lewysohn 1877, pp. 52–53; Yudlov 1984, no. 323.